Summer school is in session! We wrapped up our regular school year on June 5, and we took last week off completely. We had long, lazy mornings. We made pancakes. We went swimming. Basically, we had a little stay-cation, and yesterday, we got back to work–summer style. 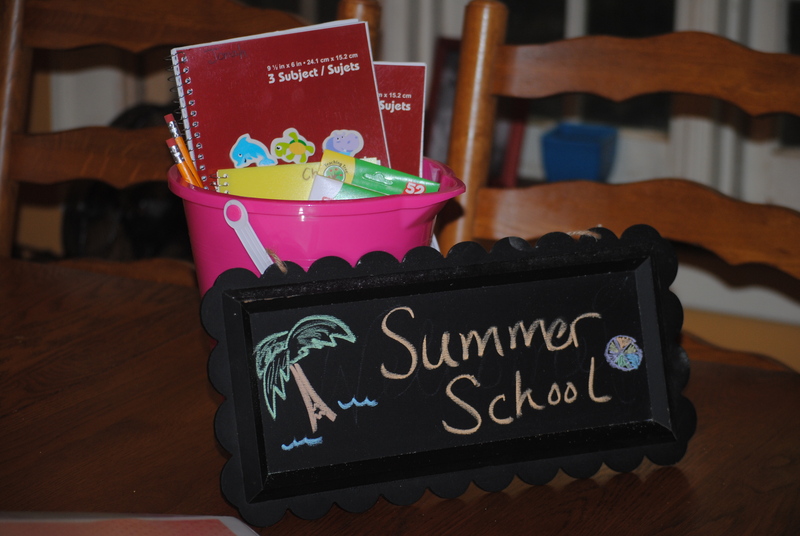 In our summer school bucket, I included a new pencil for each student, a bunch of fun erasers from the Dollar Tree, a new notebook for each student, some math flash cards, and a new set of double-tipped markers. I had the bucket and the summer school sign on the dining room table when everyone woke up. It helped set the tone for our day and hopefully our whole summer. 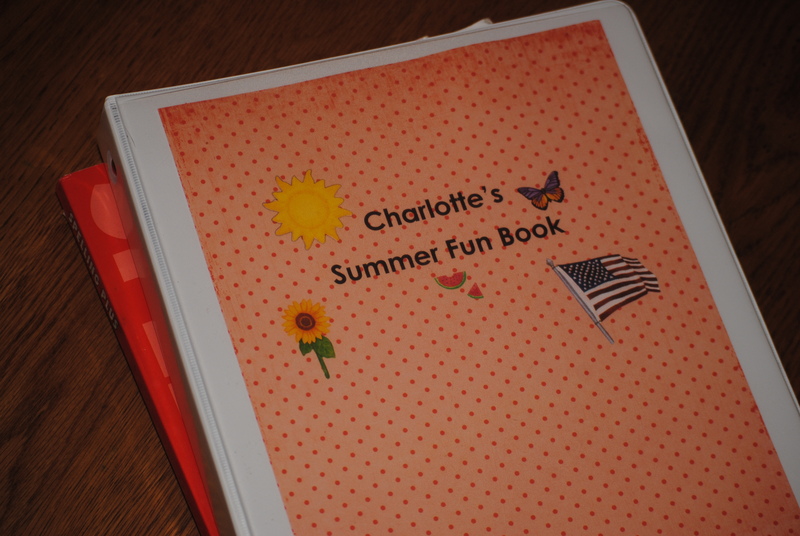 For my little preschooler, I made this “Summer Fun Book.” I’ve been collecting links on Pinterest for a few weeks, and I printed coloring pages and activities for Charlotte to enjoy while her brothers do their summer school lessons. All of this makes me think of The Sound of Music. Maybe you’ll remember the scene, too. The housekeeper tells Maria, “The Von Traap children don’t play. They march.” Well, don’t worry! We aren’t missing the joys of summer. Our summer school is going to take 1 to 1.5 hours per morning, Monday through Thursday, and we have some projects (and books!) in progress for the afternoons. We have a lot of fun things planned for the season. I think I’ll do another post about our Summer Bucket List. There is much fun to be had! Last week was fun and very full. We had cool things going on almost every day. Monday, our family of four joined my parents at the zoo. Despite the 90 degree weather, we had a wonderful time. We followed up that adventure with a picnic in the park. A gourmet picnic, I might add. My mom made one of those big sandwiches on a big round loaf of marble rye. Gorgeous! She brought fruit salad and a yummy sweet potato salad that was delicious and so pretty. On Tuesday, we met some friends for a play date at the library and lunch at a picnic table outside. That afternoon we drove to my in-laws. We had dinner with them, and we all enjoyed their wonderful pool. That evening my mom-in-law, her sister, and I went blueberry picking. 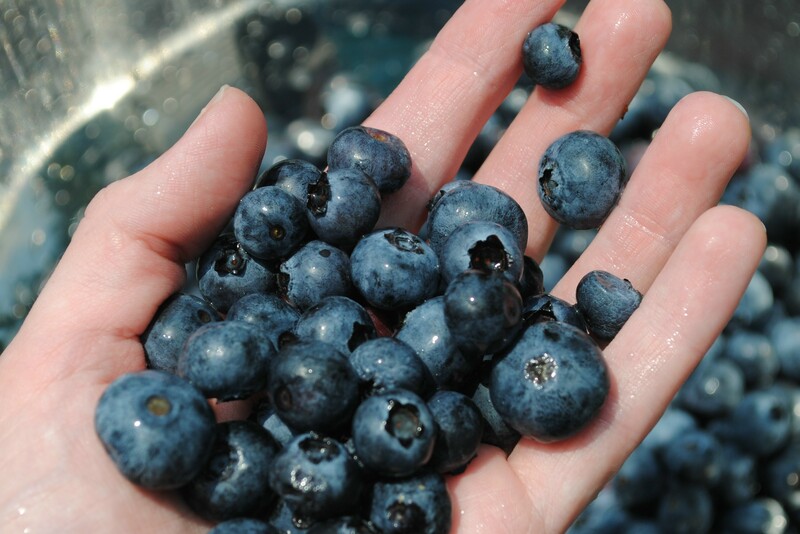 We picked and picked from the abundant crop. Some branches were so full of beautiful fruit that I don’t know how they didn’t buckle. The farm was so quiet. The hot day simmered down to a balmy evening. Long after the sun was down but the evening sky still glowed, we continued filling our buckets. On Wednesday, we joined our friends (a family that we’ve come to know through preschool) at a great park about 30 minutes from here. The park has an “exhibit farm” where you can visit the animals. I’ve never seen such interesting breeds of chickens. After the farm, we went to another section of the park that has fun sprinklers. My older boy adored that part of our trip. Thursday was a nice quiet day at home. We did some housework. And Friday was our monthly La Leche League meeting. For the first time ever, I went without a little one by my side. My goodness, it seems that our little family is entering a new era (at least for now). Saturday was “Relay for Life,” an event that is close to my heart. Wishing you weeks full of summer fun!